Background: Septicemia in neonates is one of the leading causes of mortality. The increasing number of multidrug-resistant pathogens is a serious concern. With this background, this study was done to evaluate the risk factors of late-onset sepsis (LOS) (community- and hospital-acquired infections) in newborns and to determine the antibiotic resistance pattern of the isolates in these infections. Materials and Methods: This retrospective study was conducted at Sarojini Naidu Medical College, Agra, on newborns admitted between August 2015 and January 2016. Newborns with the final diagnosis of sepsis obtained from the case records during the study period were included in the study. Those newborns with positive blood culture results were included in the study. Clinical details and antibiotic sensitivity of the isolates were also obtained from the records. Results: Sixty-eight newborns with LOS (38 community- and 30 hospital-acquired infections) were included in the study. Staphylococcus and Klebsiella were the most common bacteriological isolates for both community- and hospital-acquired infection cases in 36%, 26% and 26%, 33.3%, respectively. Home delivery (52.6%) and faulty breastfeeding were (57.8%) seen in significantly larger numbers in community-acquired infections (P = 0.03 and 0.01, respectively) whereas invasive procedures such as intubation were seen in 40% of nosocomial infections as compared to only 5.2% of community-acquired infections. Antibiotic susceptibility pattern in both the infections was similar. Staphylococcus aureus was susceptible to vancomycin in 100% cases while high resistance was seen for ampicillin in both the groups. Similarly, gentamicin was found to be resistant in both the groups for Klebsiella while imipenem was susceptible in 100% cases. Conclusion: Both community- and hospital-acquired infections had similar isolates and antibiotic susceptibility pattern; however, the risk factors associated with both the infections differed. Septicemia in neonates is one of the four leading causes of neonatal mortality in India. The incidence of neonatal sepsis according to the data from the National Neonatal-Perinatal Database (2002–2003) is 30/1000 live birth. Neonatal sepsis may be early onset or late onset depending on the time of onset. Early-onset sepsis is considered to be acquired from the maternal genital tract whereas late-onset sepsis (LOS) is considered to originate from health-care setting or from the community. There is a lack of etiological data on neonatal sepsis acquired in the community, due to insufficient laboratory facilities in rural areas and potentially low levels of care seeking, resulting in much-unreported morbidity and mortality. In developing nations, the likelihood of these infections is increased due to unsafe delivery practices, lack of early, and exclusive breastfeeding. The national nosocomial infection surveillance system reports a rate of 14.15 nosocomial infection per 1000 patients. The risk of nosocomial infections is predominantly affected by prematurity, invasive procedures, and duration of stay in the hospital. These infections are a significant hazard in health-care facilities, causing increased morbidity and mortality in newborns. There is a wide variety of organisms causing LOS. Coagulase-negative staphylococci have been reported to be the most common pathogen accounting for around 77.9% LOS cases in industrialized countries and 47.4% in developing countries. In addition, there are reports of increasing antibiotic resistance to these pathogens. With this background, the present study was undertaken to study the clinical and bacteriological profile of neonatal septicemia in community- and hospital-acquired infections and their antibiotic sensitivity pattern and risk factors for planning strategy for better management of these cases. This retrospective study was conducted between August 2015 and January 2016. Case records of newborns admitted to the Neonatal Intensive Care Unit of our tertiary care hospital during this period were obtained from the medical records section. Details of newborns with the final diagnosis of sepsis were reviewed. Neonates fulfilling the criteria for community- and hospital-acquired infections with positive blood culture were included in the study. Neonates with early-onset sepsis and congenital infections were excluded from the study. Community-acquired infections were defined as invasive bacterial infections (bacteremia, pneumonia, meningitis, and others) presenting as LOS after 72 h of birth. Nosocomial infection was defined as any infection causing illness that was not present at the time of admission and occurred after 48 h of hospitalization. Details of study participants were obtained from case records including birth weight, gestational age, place and mode of delivery, breastfeeding pattern (prelacteal feeds, diluted animal milk, and bottle feeding), invasive procedures, duration of stay in the hospital, and other relevant information. Culture reports with their antibiotic sensitivity pattern were also noted from the records. Antibiotic sensitivity testing was performed by modified Kirby-Bauer disc diffusion method as per CLSI recommendations. Data were analyzed using IBM Corp. Released 2012. IBM SPSS Statistics for Windows, Version 21.0., (Armonk, NY: IBM Corp.). The association of variables (gender, prematurity, birth weight, place and mode of delivery, and breastfeeding) in the community-acquired infections and nosocomial infections was compared using Chi-square test. P < 0.05 was taken as statistically significant. Of 182 case records reviewed with the final diagnosis of sepsis, blood cultures were positive in 76 cases; 8 cases positive for fungal growth were excluded from the study. Sixty-eight (37.4%) cases with positive blood culture for microbes were included in the study, with 38 (55.8%) were community-acquired infections and 30 (44.1%) were nosocomial infections. Profile of participants with nosocomial and community-acquired infections is shown in [Table 1]. Most of the participants were males in both the community and nosocomial infections, 73.6% and 66.6%, respectively. Faulty breastfeeding practices were seen in 57.8% of community-acquired infections which were significantly more than nosocomial infections which showed faulty feeding in 8 (26.6%) cases (P = 0.01). Gestational age <37 weeks and newborns with birth weight <2500 g were seen in a similar number of cases in both community-acquired infections and nosocomial infections (P = 0.954, P = 0.373, respectively). Home deliveries were more commonly associated with community-acquired infections seen in 52.6% cases (P = 0.03). Invasive procedures such as intubation were noted in 12 (40%) participants as compared to only 2 (5.2%) participants in community-acquired infections. Duration of stay in the hospital-acquired infection (21 ± 2 days) was much more than community-acquired infections (14 ± 2 days). In community-acquired infections, the most common organism isolated was Staphylococcus aureus (36%) followed by Klebsiella and Escherichia More Details coli in 26% and 21%, respectively. Other less common isolates were Pseudomonas (5%), Acinetobacter (5%), and Enterococcus (5%). In nosocomial infections, the most common isolates were Klebsiella (33.3%) and Staphylococcus (26%). Other less common isolates were E. coli (13.3%), Acinetobacter, (13.3%), Pseudomonas (6.6%), and Streptococcus (6.6%). [Table 2] and [Table 3] show the antibiotic resistance patterns of the common organisms (Gram-positive and Gram-negative organisms), respectively, isolated in community-acquired and nosocomial infections. [Table 2] shows that none of the staphylococcal isolates were resistant to vancomycin whereas ampicillin was found to be resistant in 98.2% of community-acquired infections and 87.5% of nosocomial infections. [Table 3] shows that Klebsiella and E. coli were resistant to commonly used antibiotics; gentamicin was resistant in 80% cases of Klebsiella isolated in community-acquired infections and 90% of nosocomial infections. Cefotaxime was resistant in 50% cases of Klebsiella isolates in both the groups. Resistance was not detected to imipenem in any of the Klebsiella isolates. Newer combinations of antibiotics such as piperacillin/tazobactam and cefoperazone/sulbactam showed resistance in 20% and 10% isolates of community-acquired infections, respectively. These newer antibiotics showed resistance in only 10% cases of nosocomial infections. E. coli showed antibiotic resistance pattern similar to Klebsiella. Gentamicin showed resistance in 75% and 100% isolates of community-acquired and nosocomial infections, respectively. No resistance was detected for imipenem and piperacillin/tazobactam in community-acquired infections. 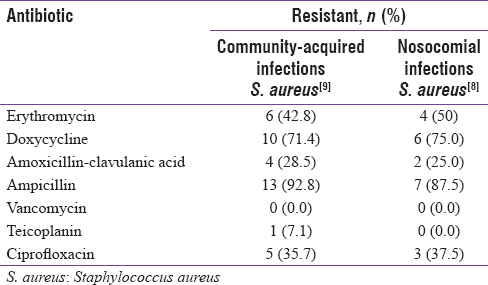 Most commonly isolated organisms in community-acquired infections were S. aureus, Klebsiella species, and Escherichia. These results are similar to a previous review, where the order of prevalence was S. aureus, E. coli, and Klebsiella species. A recent study of hospital-acquired neonatal sepsis in developing countries showed a predominance of Gram-negative organisms with Klebsiella species being most commonly isolated, followed by S. aureus and then E. coli. This is similar to our findings, which further suggest potential similarities in major pathogens between community- and hospital-acquired neonatal sepsis in developing countries. This study has shown vancomycin to be most sensitive drug for S. aureus in nosocomial as well as community-acquired infections. According to a recent study, none of the staphylococcal isolates were resistant to vancomycin. The present study showed that S. aureus was resistant to ampicillin in most of the cases. High resistance to ampicillin could be probably due to its use as first-line drug in our setup. Amikacin has good sensitivity rates for Klebsiella and E. coli in both community-acquired and hospital-based infections which is consistent with other studies. However, gentamicin and cefotaxime have been shown to be resistant in most cases which can be explained by their use as first-line drug. It was demonstrated in an Asian study that 37% of all Gram-negative organisms were resistant to gentamicin and about one-third were resistant to both gentamicin and third-generation cephalosporin. It has been shown that piperacillin/tazobactam and cefoperazone/sulbactam were the effective antibiotics against Gram-negative organisms in our study, as also reported in another study. Imipenem has shown no resistance to the isolates of Klebsiella and E. coli in our study as also noted in another study. There are limitations to this single-center study because of the small sample size. The present study showed an alarming increase in the prevalence of strains resistant to the commonly used antibiotics. Therefore, a great caution is required in the selection of suitable antibiotic therapy. The antibiogram pattern showed similar resistance pattern in both community-acquired and nosocomial infection groups. The study also emphasizes the need for preventive measures such as early and exclusive breastfeeding, promoting hospital deliveries to reduce the number of community-acquired infections. Moreover, simple techniques of maintaining aseptic precautions for invasive procedures such as intubation would help in reducing the nosocomial infections. Singh M, Deorari AK, Khajuria RC, Paul VK. Perinatal & neonatal mortality in a hospital. Indian J Med Res 1991;94:1-5. Report of the National Neonatal Perinatal Database (National Neonatology Forum); 2002-03. Available from: http://www.newbornwhocc.org/pdf/nnpd_report_2002-03.PDF. [Last accessed on 2016 Feb 18]. Zaidi AK, Thaver D, Ali SA, Khan TA. Pathogens associated with sepsis in newborns and young infants in developing countries. Pediatr Infect Dis J 2009;28:S10-8. Lodha R, Natchu UC, Nanda M, Kabra SK. Nosocomial infections in Pediatric Intensive Care Units. Indian J Pediatr 2001;68:1063-70. Kamath S, Mallaya S, Shenoy S. Nosocomial infections in Neonatal Intensive Care Units: Profile, risk factor assessment and antibiogram. Indian J Pediatr 2010;77:37-9. Joyce ST, Barbara MS, Mark TL. Nosocomial infections: An overview. In: Barbara JH, Klaas J, Weissfeld AS, Tilton RC, editors. Clinical and Pathogenic Microbiology. 2nd ed., Ch. 4. St Louis: Mosby; 1994. p. 83-99.
van den Hoogen A, Gerards LJ, Verboon-Maciolek MA, Fleer A, Krediet TG. Long-term trends in the epidemiology of neonatal sepsis and antibiotic susceptibility of causative agents. Neonatology 2010;97:22-8. Leal YA, Álvarez-Nemegyei J, Velázquez JR, Rosado-Quiab U, Diego-Rodríguez N, Paz-Baeza E, et al. Risk factors and prognosis for neonatal sepsis in Southeastern Mexico: Analysis of a four-year historic cohort follow-up. BMC Pregnancy Childbirth 2012;12:48. Turkish Neonatal Society; Nosocomial Infections Study Group. Nosocomial infections in neonatal units in Turkey: Epidemiology, problems, unit policies and opinions of healthcare workers. Turk J Pediatr 2010;52:50-7. Levy O. Innate immunity of the newborn: Basic mechanisms and clinical correlates. Nat Rev Immunol 2007;7:379-90. Zaidi AK, Huskins WC, Thaver D, Bhutta ZA, Abbas Z, Goldmann DA, et al. Hospital-acquired neonatal infections in developing countries. Lancet 2005;365:1175-88. Borghesi A, Stronati M. Strategies for the prevention of hospital-acquired infections in the Neonatal Intensive Care Unit. J Hosp Infect 2008;68:293-300. Singh M, Narang A, Bhakoo ON. Predictive perinatal score in the diagnosis of neonatal sepsis. J Trop Pediatr 1994;40:365-8. Távora AC, Castro AB, Militão MA, Girão JE, Ribeiro Kde C, Távora LG, et al. Risk factors for nosocomial infection in a Brazilian Neonatal Intensive Care Unit. Braz J Infect Dis 2008;12:75-9. Clark R, Powers R, White R, Bloom B, Sanchez P, Benjamin DK Jr., et al. Nosocomial infection in the NICU: A medical complication or unavoidable problem? J Perinatol 2004;24:382-8. Aziz K, McMillan DD, Andrews W, Pendray M, Qiu Z, Karuri S, et al. Variations in rates of nosocomial infection among Canadian Neonatal Intensive Care Units may be practice-related. BMC Pediatr 2005;5:22. Waters D, Jawad I, Ahmad A, Lukšić I, Nair H, Zgaga L, et al. Aetiology of community-acquired neonatal sepsis in low and middle income countries. J Glob Health 2011;1:154-70. Desai KJ, Malek SS, Parikh A. Neonatalsepticemia: Bacterial isolates & their antibiotic susceptibility patterns. Gujarat Med J 2011;66:13-5. Al-Taiar A, Hammoud MS, Cuiqing L, Lee JK, Lui KM, Nakwan N, et al. Neonatal infections in China, Malaysia, Hong Kong and Thailand. Arch Dis Child Fetal Neonatal Ed 2013;98:F249-55.